ST. JOHN'S, N.L. 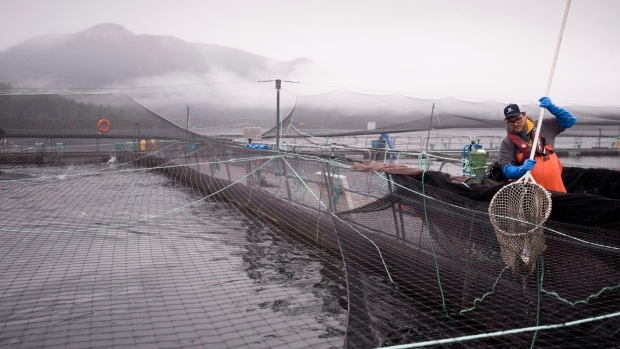 -- Ottawa plans to develop legislation aimed at giving the country's aquaculture sector a boost. "It allows us to discuss things like best practices and ensure that we're doing everything that we can to both grow the industry but to ensure that it's done in an environmentally sustainable way," Wilkinson said after a meeting of Canadian fisheries and aquaculture ministers in St. John's, N.L. "Such federal legislation will ensure that Canada's aquaculture sector is a global leader in producing high quality aquaculture projects in an environmentally sustainable matter." Federal environment commissioner Julie Gelfand issued a report this year warning of the disease risk that farmed fish pose to wild salmon, finding that Fisheries and Oceans Canada had not adequately balanced the industry's risks with its mandate to protect wild fish. Gelfand's audit called for better monitoring and more detailed scientific study of the industry's effects on wild fish. Newfoundland and Labrador has been criticized by environmental groups, including the Atlantic Salmon Federation, for fast-tracking assessments on planned aquaculture projects along the island's south coast. Also Wednesday, Ottawa and Newfoundland and Labrador announced $18.5 million in funding for the province's fish and seafood sectors. Money will also go towards improving the province's harvesting and processing sectors, innovation, and development research and scientific projects to fill knowledge gaps to improve stock assessments and management strategies.